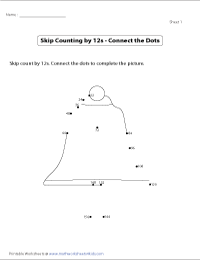 A huge collection of worksheets, printable charts, mazes and connecting dots provide adequate practice for children to learn skip counting by 12s. 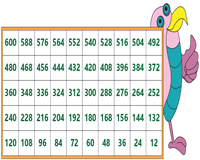 Children develop their skills in counting forward and backward by practicing these worksheets. 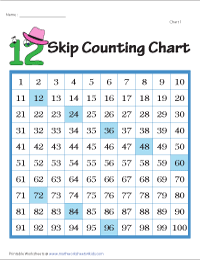 These printable charts help the kids learn skip counting by 12s. 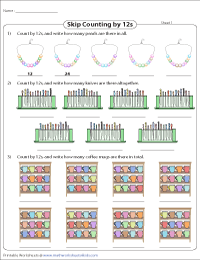 Glue these display charts in a classroom or study room. Grasp the concept of reverse skip count in 12s easily with these vibrant display charts. Utilize the partial and blank charts available here to recapitulate. 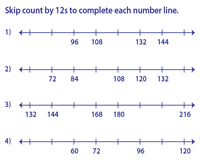 Count by 12s to complete the number line. The range of numbers is higher in level 2 than level 1. There are twelve items in each set. Count by 12s to find the total items. 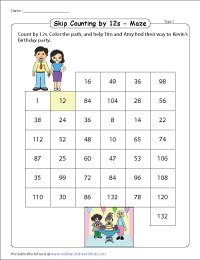 The worksheets help the kids count in dozens. Count by 12s to complete the path. Help the prince reach the princess. Guide the mouse find the way to garden. Teacher templates are availabe. 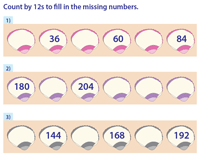 Fill in the missing numbers on the shells by counting in 12s. The number range is from 12 to 240. 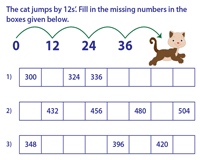 The cat jumps by 12s'. 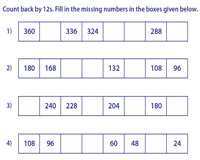 Count by 12s to fill in the missing numbers. Count backwards by 12s to fill in the missing numbers. 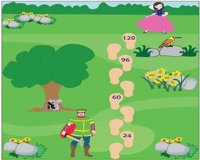 These engaging maze worksheets contain three themes - birthday party, cowboy and birthday gifts. Connect the dots to reveal the picture. The numbers are in multiples of 12.